Ask most New Yorkers and they’ll claim what unifies them with the other 8.5 million who live in the city is a love of good bagels, an aversion to subway dance performances, and annoyance at slow-walking tourists. But beginning this month, another thing will connect the residents of NYC—and Lehman will play a key role. One Book, One NY is the latest program in the national One Book, One City initiative. 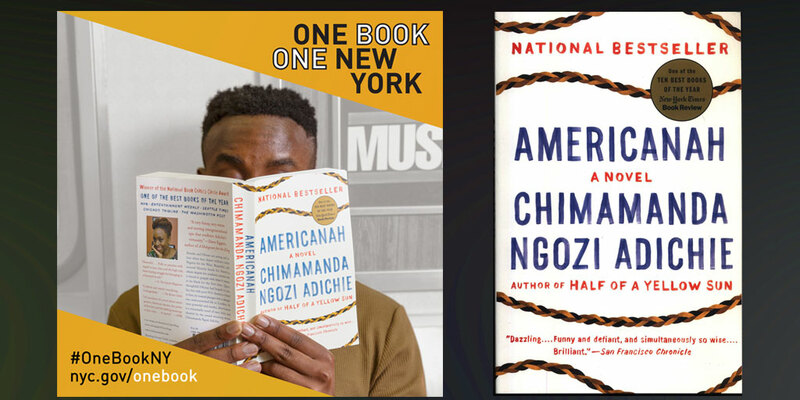 It aims to be the largest community reading group in the country, a five borough-wide book club where there are multiple events to discuss and explore themes found in Chimamanda Adiche’s National Book Award-winning Americannah. The 2013 novel is the story of a young woman and man from Nigeria grappling with the challenges of immigration, displacement, race, and love. The College will hold two events for One Book, One NY. The first, on April 26, is a reading-teaser panel on the novel. Lehman professors Bertrade Ngo-Ngijol Banoum (Women’s Studies), Anne Rice (Africana Studies), and Susan Watson-Turner (Theatre and Dance) will discuss the book in order to prepare attendees to read it over the summer. The first chapter of the novel will be available for download in advance, and students can also download the free audio version of Americannah beginning on March 16 (the link expires in 90 days). Two weeks later, on May 10, there will be a College-wide event that pulls out topics from Adichie’s novel and explores them in a very different setting and medium. In collaboration with the Mayor’s Office of Media and Entertainment (MOME) and the African Film Festival, the College will host a screening of author and filmmaker Raquel Cepeda’s latest documentary, Some Girls. The screening will be followed by a multimedia panel discussion and Q&A session. “All around the city, there are events that speak to themes raised by Adichie’s book, particularly immigration, feminization, and race,” said Paula Loscocco, chair of the English Department. “Some Girls is a film about Dominican girls in the Bronx and Dominican Republic working through painful identity issues.” President Cruz will be in attendance, as will local elected officials including Bronx Borough President Ruben Díaz, Jr. (B.A., ‘05) and the filmmaker. Panelists include: Cepeda; Lehman alum Noelle Santos (B.A. ‘09; M.A. ‘12), who is opening the Bronx’s only independent bookstore; journalist Andrew Boryga; and Professor Milagros Ricourt, from the College’s Latin, Latin American, and Puerto Rican Studies department. The teaser-panel will take place on Wednesday, April 26 at 6pm,in Lief Library’s Fine Arts Classroom, Room 226A. The Wednesday, May 10th screening of Some Girls and the panel discussion that follows will be held in the Lovinger Theater (Music Building) beginning at 6:00 pm.